A BARNSTORMING DISPLAY from Willis Halaholo and Gareth Anscombe denied Munster top-spot in their Guinness PRO14 conference as they slumped to a 37-13 defeat in Cardiff. An Andrew Conway double was not enough to stop the visitors heading in behind at half-time after converted tries from Nick Williams and Tomos Williams. Instead of fighting back, Munster were powerless to stop Halaholo from scoring, while Tomos Williams completed his double late on to add to Anscombe’s 17 point haul from the kicking tee. Munster were let off the hook after Owen Lane’s early try was wiped out for a block in the build-up, but they were not so lucky second time around. Despite the defence’s best efforts, no one could haul down Halaholo as he charged towards the line. Powerful no.8 Williams picked up and finished it off at the posts to give Anscombe an easy conversion for a 7-0 lead, before Conway crossed twice in three minutes to edge Munster in-front. The flying wing had it all to do after O’Mahony stole the ball back on half-way, but Conway sprinted down the wing, chipped the ball and sprinted away from Anscombe to scoop up and score. His second came after Joey Carbery lit up the turf with a 60 metre run from his own 22. The out-half started the move and finished it three phases later to send Conway over at the corner for a 10-7 lead. Carbery failed with his second conversion attempt, and Munster were made to pay. Again it was Halaholo who sliced through in midfield and charged downfield before finding Tomos with a scoring pass. Unlike Carbery, Anscombe was on target to send the hosts in to a 14-10 lead. Carbery found his kicking boots to cut the gap to a single point at half-time with a long range penalty, but the Blues flew out of the blocks after the restart. Anscombe booted them downfield after Nick Williams won a penalty at the breakdown, before Halaholo scorched through in midfield for a third time. This time he went all the way to score at the corner, and Anscombe added the extras to make it 21-13. 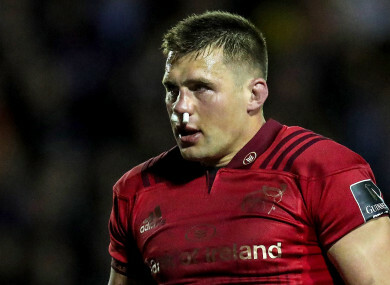 He landed a long-range penalty to take his side 11 points clear before Munster tried to muscle their way back into the match. The pack were camped on the Cardiff line but some heroic defence forced Chris Cloete to hold-on and concede a penalty. Munster then found themselves 14 points down after Anscombe kicked another penalty following a scrum. There was still time for it to get even worse for van Graan as Tomos Williams sniped over to score his second try of the game and secure a first bonus-point victory for Blues head coach John Mulvihill. Tries: N Williams 8, T Williams 17, 76, Halaholo 45. Cons: Anscombe 8, 18, 46, 77. Pens: Anscombe 53, 64, 71. Cardiff Blues: M Morgan; O Lane (Tom Williams 79), W Halaholo (G Smith 79), R Lee-Lo, J Harries; G Anscombe, Tomos Williams (L Williams 79); R Gill (R Carre 73), K Dacey (K Myhill 73), D Arhip (S Andrews 69), G Earle (Cook 25), J Turnbull, J Navidi (O Robinson 61), E Jenkins (capt), N Williams (O Robinson 17-30). Munster: JJ Hanrahan; A Conway, J Taute (S Daly 61), R Scannell, D Sweetnam; J Carbery, D Williams; J Cronin (D Kilcoyne 53), M Sherry (D Barron 74), S Archer (B Scott 75); J Kleyn (D O’Shea 75), T Beirne; P O’Mahony (capt), C Cloete, CJ Stander (T O’Donnell 65). Email “Halaholo haunts Munster as Cardiff smash their way to bonus point win”. Feedback on “Halaholo haunts Munster as Cardiff smash their way to bonus point win”.